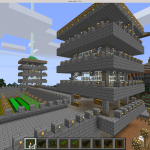 2015-01-22: Released InstaTower 1.5.6 (Forge-1.7.10). 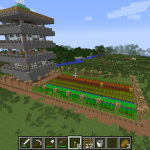 Structures are built using comparable blocks from current dimension (overworld [default], nether, or end). Enclosed exposed tunnels. Eliminate lava and blocks above structure in nether to avoid lava rain. Made recipes much more expensive for better balance. 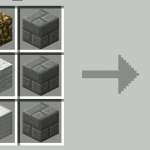 Made recipes accept log, wool, and brick variants. My children love to play Minecraft! The endless variety is one of the big reasons they never get bored. Just when the game begins to feel stale, they download a new mod or install a new texture pack, and it’s a brand new game! It never gets old. 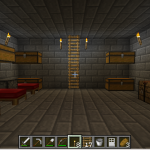 The core InstaTower item contains plenty of beds, well-stocked chests (diamonds, arrows, steak, rails, etc.). Plus, it has a beacon on top, so you can easily power-up and find your way home. The basement level has a tunnel, which descends to the lower levels of the world, where diamonds and other rare ores are more plentiful. The tunnel contains stairs, torches, and a circuitous rail line, which explores the mining tunnel and lateral run, and then returns. 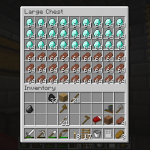 … The crafting recipe is comparatively cheap, although it requires items from later in the game (glow-stone, diamond block, emerald block, iron block, gold block, log, and stone-brick), so it is not too easy to craft. The tower will always be rotated, so that the player is looking into the entry door of the tower, and the block clicked to place the tower will always be the “red-carpet entrance” into the tower. 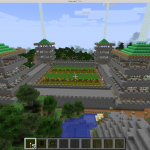 The InstaGarden provides a complete garden, enclosed in a fence with gates and is well lit with glowstone to prevent hostile mobs from spawning in the garden. It can be placed adjacent to the InstaTower to provide a safe provision of sustainable food for the adventurous explorer. It also contains a few animals to start a farm or provide transportation. When placed correctly, InstaTowers may be connected with an InstaWall item, which provides protected access between 2 towers as well as a connected rail line at the basement level. Ultimately, an InstaCastle may be crafted using 4 InstaTowers, 4 InstaWalls, and an InstaGarden. 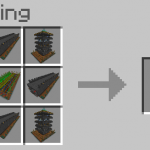 This item correctly places 4 InstaTowers connected by 4 InstaWalls to create a castle with 4 independent mining tunnels and a large, single connected rail line that connects all 4 towers and explores the mining tunnels and shafts created by all 4 tunnels. The courtyard of the castle contains two InstaGardens and animals to completely satisfy dietary and transportation needs. All structures adapt to their dimension. In the overworld, stone bricks, glass, and wooden fences are used. In the nether world, nether bricks, iron bars, netherack, and nether fences are used. In the end dimension, obsidian is used. For many people, this MOD provides far too much structure and and far too many items for too little cost. To remedy this, many of the items and structures can be disabled server side by a editable configuration file, instatower.cfg, which is initialized by the mod. Default settings may be retrieved by simply deleting the file and allowing the mod to recreate it with default values. Virtually all of the the structures features (beacon, enchantment table, diamonds, food, anvil, rail lines, the entire basement level, etc.) except stones, lighting, and ladders can be disabled via this config file. 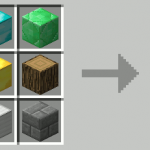 The crafting recipes for each item may also be disabled, making the items only available to users in Creative mode. An optional item is also included, the Divining Rod, which reports miscellaneous block data about any block right-clicked. This item and the provided info is handy for mod-developers but nothing more. Mod will initialize a config file upon first run, instatower.cfg, which can be edited to disable features and control tunnel depth and lengths. 1.5.6 (2015-01-22) – Structures are built using comparable blocks from current dimension (overworld [default], nether, or end). Enclosed exposed tunnels. Eliminate lava and blocks above structure in nether to avoid lava rain. Made recipes much more expensive for better balance. 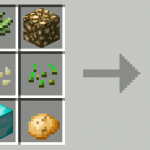 Made recipes accept log, wool, and brick variants. 1.5.4 (2015-01-07) – Added control for wall length in castle. Cleaned up comments in config file. 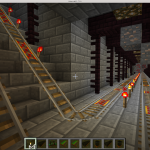 1.5.3 (2015-01-06) – Added many more switches in the config file, so that most of the features (including beacon, library, anvil, brewing stand, stocked chests, rail lines, basement level, etc.) can now be disabled via the config file. 1.5.2 (2015-01-05) – Separated InstaTower into new InstaGarden and updated version of InstaTower. Created new item, InstaWall, which creates a long wall with basement. Created new item, InstaCastle, which places 4 InstaTowers, connected by InstaWalls, with a InstaGarden in the middle courtyard. items. Added config-file control of tunnel presence, depth, length, and whether valuable ores are cleared or not. 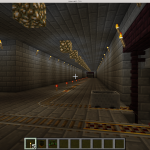 1.20 (2014-12-31) – Added basement with descending tunnel and long lateral runs at bottom of tunnel, complete with rails, torches, and carts. 1.10 (2014-12-28) – Added rotation of structure based on player’s facing direction. (When placed, player will always be looking into entry door of tower, and structure’s location will be offset such that the red-carpet will lie upon block clicked to place tower.) Fixed all glitches associated with chests, doors, and crops. Added new item, Divining Rod, which reports block id, name, coordinates, and metadata to log, which is useful for MOD developers. 1.02 (2014-12-23) – Moved config file inside JAR file. Deprecated external config file that specified tower layout. 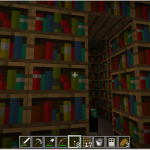 1.0.1 (2014-12-1) – Initial release. The ultimate in instant survival! InstaCastle with towers and walls provide full surveillance of courtyard and neighboring lands. First level with beds, chests, furnaces, and other tools. 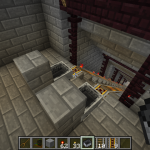 Mining tunnel access in basement, complete with stairs, rails, carts, and torches. Ores are left exposed. Mining tunnel with circuitous rail line and exposed precious ores.